(P2) Over ten days, they turned 300 old boxes into a boat. They even made some life jackets and put a small outboard on the back. They made everything else from waste packaging, including the flag, which they made from bubble wrap. (P3) They put the boat into the River Thames and all went to plan. 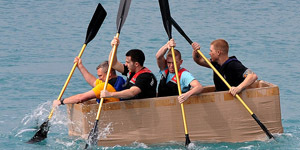 Why do you think these men built a cardboard boat? Can you build a cardboard boat? Why or why not? Have you ever been on a boat? If yes, describe your experience. If no, would you like to go on a boat? EXPRESSIONS or PHRASES: What do the following expressions or phrases mean?